Emergency personnel respond to an accident on southbound Interstate 43 (I-43) south of Mequon Rd near the N. Port Washington Rd overpass in Mequon, Wis., on Sunday, Dec. 8. A winter storm wreaked havoc in the Midwest and East on Sunday, covering roads with dangerous sheets of ice and snow that triggered fatal pileups involving dozens of cars, officials said. As temperatures plummeted, the wild storm was barreling east, threatening to slam major cities in the Northeast with rough conditions. A fatal chain-reaction crash involving “about 50 cars” shut down westbound lanes of the Pennsylvania Turnpike on Sunday afternoon, state police told NBCPhiladelphia.com. The pileup was triggered after a motorist involved in a minor accident got out of his car and was hit by another vehicle and killed, authorities said. 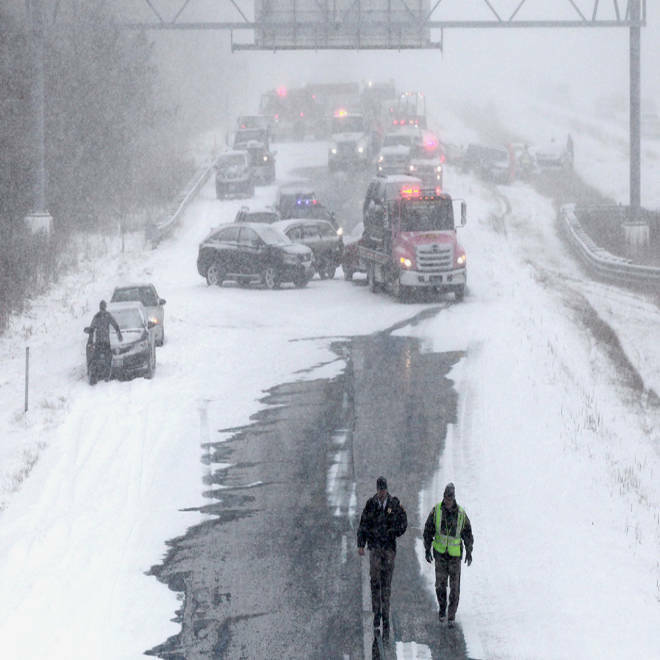 Hazardous conditions triggered multiple fatal accidents and pileups in Wisconsin. One person was killed the town of Trenton after a crash involving a semi-tractor trailer and a car, according to NBC affiliate TMJ 4. And a 39-year-old female driver died after a rollover crash on Interstate 43 in the city of Racine, according to the Milwaukee County Sheriff’s Office. Some 18 people were taken to a hospital. and six of them were in critical condition Sunday afternoon, the station reported. The storm hit Texas hard over the weekend, causing event cancellations, travel hindrances and power outages. NBCDFW.com listed almost 50 weekend holiday events that had been cancelled or postponed across the state, including Sunday's 44th annual Dallas Marathon, which was expected to draw 25,000 runners, many of whom had trained for months. The same weather system also forced the cancellation of the St. Jude Marathon in Memphis, which had been expected to include 20,000 competitors. Instead of running, work crews on Sunday were attempting to clear roads and Dallas Fort Worth International airport runways, and tractor-trailers remained stuck on highways, thwarting efforts to salt the slippery roads, according to NBCDFW.com. There hasn't been a break in the freezing temperatures as a storm stretched from coast to coast, Texas to Minnesota, and some residents took their skates to the streets. The Weather Channel's Mike Seidel reports. Four hundred flight departures were canceled Sunday at Dallas Fort Worth International airport, according to airport officials, as crews scrambled to clear airport runways. According to NBCDFW.com, more than 900 flights in and out of the airport were canceled Saturday, but the airport reported progress in thinning the number of stranded customers from 3,300 on Friday night to about 2,100 on Saturday night. Texas utility provider Oncor also had lower numbers of people in the dark to report. At the storm's peak on Friday, 270,000 were without power, but as of Sunday morning, that number was slashed to 40,000, according to Oncor. Numerous shelters were set up across the state in churches and community centers, according to NBCDFW.com. Just as Texas and other parts of the West started to emerge from the brunt of the storm, the Midwest and Northeast plunged into bitter cold. In Chicago, people started flooding into warming centers Saturday night as wind chills dropped below zero, according to NBCChicago.com. “Thank God we have somewhere to go in the cold weather, somewhere we can take advantage of. The cold weather is so bad it's dangerous and I have kids,” Obed Morales, who was staying in a warming center because his heater was broken, told NBC Chicago. Some parts of Illinois were already slammed by a foot of snow, and Chicago would get 1 to 3 inches on Sunday, according to The Weather Channel. Residents in parts of Ohio, Kentucky and Tennessee also woke up to snow and ice on Sunday. Bob Nations Jr., director of the emergency operations command center for the Memphis area, told The Associated Press that there were multiple multivehicle crashes. "I'm not afraid of the ice and snow, I'm afraid of the other drivers who don't know how to drive in it," said Memphis resident Sam Chafetz. In Virginia, state Emergency Management spokeswoman Laura Southard said the storm had the potential to be an "historic ice event." "This forecast is very concerning to us," Southard said. "I've worked multiple disasters, but I've never worked an ice storm with a forecast like this. It's just really important for everybody to take extra precautions." Other areas of the country that could expect snow or freezing rain Sunday were the Middle Missouri Valley into the Great Lakes, the Ohio and Tennessee Valleys, the Mid Atlantic and southern New England, according to the National Weather Service. America is freezing, and ice storms are stranding travelers, knocking out power and creating deadly conditions. TODAY's Dylan Dreyer reports. Mississippi, the Central Gulf Coast and the Tennessee Valley were all expected to dodge snowfall but could experience heavy, cold rain, the NWS predicted. Residents in New York, Philadelphia, Washington D.C., and Baltimore were warned to be careful on the roads, as they could be hit by the first major snow accumulation of the season Sunday night, according to The Weather Channel. But the snow is expected to change to rain overnight, the Weather Channel reported, making the morning commute a messy one. In New England and upstate New York, even a slight snowfall could create Monday morning problems as it changes to freezing rain and slippery sheets of ice, according to The Weather Channel. The snow is expected to change to rain across a wide swath of the eastern U.S. overnight, the Weather Channel reported, making the morning commute a messy one. "What's happening across most of the country is we're getting a very early taste of winter," Mike Muscher, a National Weather Service meteorologist told Reuters. "This is something you'd typically see in January or February," he said. The storm is expected to move out to the Atlantic on Monday night, according to the National Weather Service. 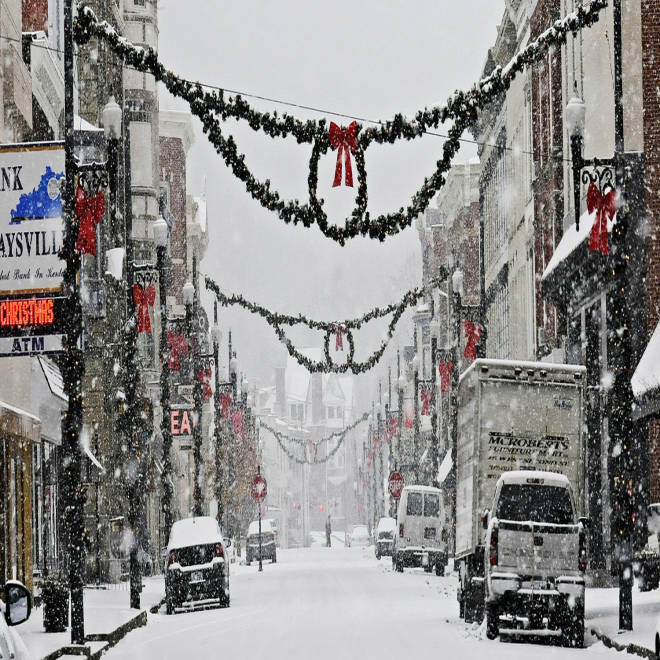 Snow falls in the downtown area of Maysville, Ky., on Sunday.